While many government schools in the state are suffering from want of students, the one at Vittla in Bantwal taluk of Dakshina Kannada district sees parents queue up to admit their wards. While many government schools in the state are suffering from want of students, the one at Vittla in Bantwal taluk of Dakshina Kannada district sees parents queue up to admit their wards. During the current academic year, 203 students have taken fresh admissions to classes 1-9 at the Government Model Higher Primary School taking its strength to 736, compared to last year’s 534. This apart, the nursery opened at this school last year has seen its strength go up from 86 to 203 this year. What’s more surprising is the government school is giving several private schools in its vicinity a run for their money. At least 25 students from four private schools have joined the government school this year, a trend which is rare elsewhere. So much was the rush for admissions that the headmaster had to convince people of neighbouring villages to admit their wards to their nearby government schools. The turnaround of the school is attributed to the improvement in the physical infrastructure and quality in teaching. Six months ago, Ajit Kumar Rai, an industrialist and an alumnus of the school donated a three-storey building worth Rs 1.25 crore to his alma mater. Many other alumni also joined him to contribute their might to the school. As a result, the school acquired the characteristics of a private institution complete with school bus, computer and science laboratories, library and English speaking course and extra-currucular activities like karate, music and Bharatanatyam. Sri Sathya Sai Annapurna Seva Trust provides breakfast to the students everyday. 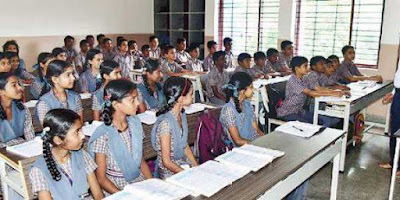 The school alumni who formed a committee have also recruited 11 teachers and three helpers and pay them.Headmaster Vishwanath Gowda said 125 students have taken admissions to class 1 this year till Saturday.